BECAUSE the Moon is not a planet, but a satellite of the earth whose luminosity, tidal influence, and electromagnetic power upon life is markedly altered by its swiftly changing relations to the lines of force flowing from Sun to earth, and from earth to Sun, the commencement of its Cycle is not determined in the same way that those of the Sun and planets are. The ebb and flood of magnetic and mental forces affecting all life upon the earth are as intimately bound up with the relation of the Moon to the line of energy exchange between earth and Sun, as the vital forces are dependent upon the relation of the positions of the Sun to the equator of the earth; positions which, one following another, bring the heat of summer, the declining days of fall, the winter’s nights of icy chill, and then spring’s glad renewal of dormant life. Compared to Sun and Moon, the influence of the other planets upon the tides of earth, and upon the light which the earth receives, is small. Nor do these other planets in their cycles influence the affairs of cities and nations through more than a limited number of channels. But both Sun and Moon, by the positions of the planets in their cycles, and the progressed aspects made to these positions, utilize the channels of influence of all these planets, and through them affect every department of human life. Due to the peculiar relationship mentioned between the Moon and the lines of exchange between Sun and earth, the Cycle of the Moon commences at the exact moment the Moon is conjunction with the Sun. This position often is called the LUNATION; but I find no occasion to depart from the popular custom of referring to it as NEW MOON. A chart erected for the exact moment the New Moon (Lunation) occurs at a given place is a chart of the conditions and events relative to all twelve departments of human life, as they will develop at that place during the following lunar month. Such a chart is subordinate not merely to progressed aspects which during its existence may form in the Cycles of the planets, but also to the Sun Cycle chart for the year. That is, if the Sun Cycle chart for the year indicates passive conditions relative to a given department of life, violent conditions relative to this same department of life as shown in the New Moon Cycle, would be violent only in comparison with other months of the same astronomical year. Or if the Sun Cycle chart indicated drastic occurrences affecting a certain department of life, and the New Moon Cycle indicated little action relative to this department of human affairs, it would only mean that, compared to the other months of the year, this one would be comparatively quiet and mild. Subject to the general conditions affecting the world or a nation during a much longer period of time, a New Moon chart may be read as a natal chart of the month to follow. While planets strongly aspecting the New Moon (the Sun-Moon conjunction) have more significance as to the events which will happen during the month, yet any planets which are powerful by position, even if not aspecting the New Moon, also are quite significant of events. This does not mean that all the important events of the month are signified in their relative importance by the New Moon chart. The most important events of each type are indicated by appropriate progressed aspects in the Cycle Chart of the planet to which by type they belong. In other words, the most important gangster and dictator activities are dated and indicated by progressed aspects in the Pluto Cycle, the most important dramatic events and promotion schemes by progressed aspects in the Neptune Cycle the most important radical activities and inventions by progressed aspects in the Uranus Cycle, the most important events relative to economy, lands and security by progressed aspects in the Saturn Cycle, the most important treaties and religious movements by progressed aspects in the Jupiter Cycle, the most important violence, accidents and strife by progressed aspects in the Mars Cycle, and still other important events by progressed aspects in the Sun Cycle. 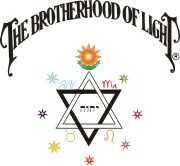 But aside from these events, which usually are more precisely timed by a progressed aspect to the same planet in the New Moon Cycle, and in addition to them, the New Moon chart gives a general picture of the events which will happen during the month affecting each of the twelve departments of life. As the New Moon is a cycle dependent upon the position at the time of both the Sun and Moon, the time events indicated by each house of the New Moon chart will take place is when either the Sun or Moon by progression, which in mundane astrology means its position as shown on that day in the ephemeris, makes aspects to the position of the planet in the New Moon chart, ruling the house affected. That is, when either Moon or Sun reaches an aspect to the place of Pluto in the New Moon chart, not only are events involving cooperation or dictatorship then attracted, but the cooperation or dictatorship affects the department of life governed by the houses Pluto rules in the New Moon chart. In reading a New Moon chart as a birth chart of the month, one can begin with the first house as representing the health and general welfare of the people, and their temperament; the second house as their money and expenditures; the third house as newspapers, science, postal service, and local transportation; the fourth house as homes and farms, etc. But in so doing it should be remembered that in mundane astrology the houses also attain a certain broader significance. Thus the second house also relates to bankers, the third house to railroads, the fourth house to crops on the soil, the fifth house to the stock market, the sixth house to the personnel of army and navy, the seventh house to foreign countries, the eighth house to taxes, the ninth house to courts and the navy, the tenth house to the Administration, the eleventh house to Congress, and the twelfth house to crime, relief, hospitals and places of detention. More complete details of these house meanings are given in Chapter 2, Serial Lesson No. 142. 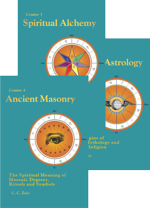 In the hope that both students and teachers may get suggestions thus that will assist beginners in their study of Mundane Astrology, I will explain the method we use in our Los Angeles classes. With the exception of some two months during the World War, during which I taught astrological classes elsewhere, and a month’s vacation each summer during which another teacher taught the class, I have taught a weekly class in Mundane Astrology here in Los Angeles for 23 years. In all our various astrological classes, the students are not permitted to know the answers in advance. When a natal chart is thrown on the screen (we use lantern slides in such work as well as blackboard) and read by the students, they are never permitted to know the identity of the person owning the chart until after the delineation is made. 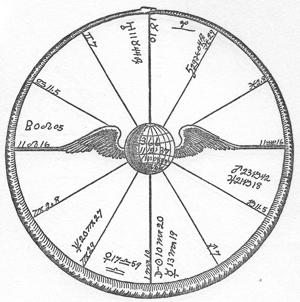 When in connection with a birth chart, progressions are stated for various events in some person’s life, the students are required to give their opinion of the event attracted by each progression; and are told what actually took place only after they have thus expressed their opinions. And in Mundane Astrology, from the Cycle Charts thrown on the screen, and a statement of the dates when given progressed aspects will form in them, the students are required to state in advance what events will transpire, and the exact dates when they will happen. The method followed, and one which can be used with equal success by students who do not attend classes, is first to observe the general trend of national and world affairs as revealed by Major Conjunctions and General Astronomical Phenomena. Then such cycle charts of the Major Planets are scrutinized as, during the future period under discussion, have progressed aspects forming in them. Every such progressed aspect indicates an event while the aspect is within one degree of perfect, characteristic of the manner in which the aspected planet works, and affecting the departments of life which the aspecting planets rule in the Cycle Chart. The heavier the aspect, the more outstanding the event. We always employ Cycle Charts erected for Washington to indicate events of national importance, Cycle Charts erected for Los Angeles to indicate events of importance chiefly to Los Angeles, and charts for the capitals of foreign nations to indicate events most pronouncedly affecting those nations. As the newspapers feature events of national importance, in preference to those of a single city or a foreign nation, it is easier to get a newspaper check on events predicted for the charts erected for Washington. Nothing can be expected to happen from a progressed aspect in a Cycle Chart that is not plainly indicated in the chart itself. After these future events are tabulated, without attempt at greater precision than the time the progressed aspect is within one degree of perfect, the progressed aspects in the Sun Cycle chart during the period covered are indicated. Each of these represents energy which will attract a Sub-Major Event during the 48 hours the aspect is within one degree of perfect. The event coincident with each aspect will partake of the nature of the planet the Sun aspects, and relate to the department of national or municipal life which that planet rules by house. These events are written down by the secretary, and by such members of the class as desire to do so. Only then do we consider the New Moon chart. The trend of this chart is taken into consideration. Each day the Moon by its movement, as shown in the ephemeris at the time, makes one, and usually several aspects to planets in the New Moon chart. 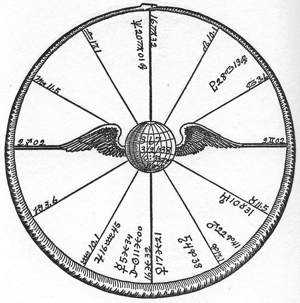 Each such aspect it makes represents planetary energy of sufficient power in affecting the unconscious minds, and thus the behavior of people, and what their thought cells working from the inner plane attract to them, that it coincides with some Minor Event in the nation or municipality. By scanning the various daily papers at the time, allowing 24 hours each way from the perfection of the progressed aspect, it is possible to find a published event coincident with each such progressed aspect that forms in the New Moon chart. Also for each progressed aspect of the Sun that forms in the New Moon chart. However, significant events are attracted only by the heavier progressed aspects in the New Moon chart; that is, by the conjunctions, oppositions, trines and squares. In connection with the progressed aspects which form in this New Moon chart, the class makes a day by day prediction for the week ahead. The truly important events indicated by progressed aspects in the Cycles of the Major Planets are listed weeks and months ahead. But as the class meets each week, the day by day forecast is commonly made only for the week ahead until the class again meets. But in this forecast, not only are several events, as shown by the progressed aspects made by the Sun and Moon in the New Moon Cycle, for each day stated, but using the progressed aspects in the Sun Cycle chart and those in the New Moon chart as adding energy of the same planetary type, or to the same house, to progressed aspects in the heavier Cycles, an attempt is made to gauge from such accumulations of energy on given days, the exact day when the Major Events indicated in the heavier cycles will transpire. In predicting events from progressed aspects in the New Moon chart, as a rule the house into which the Moon has progressed is not of outstanding importance. But if outstanding headlines of the daily papers are used later to check accuracy, it is safe to predict from each heavy progressed aspect thus made in the New Moon chart, an event of the nature of the planet the progressed Moon aspects, in addition to an event relative to the most active house in the chart which this planet rules. That is, it can be counted, allowing 24 hours from the time the aspect is complete, that prominent newspaper headlines will verify two predictions relative to each powerful progressed aspect the Moon makes in its Cycle chart. And in addition, with practice in gauging the effects of accumulating planetary energy of the same planetary type, or as affecting the same department of life, the exact day when Major Events will take place, as well as their nature, can be forecast with accuracy. But in predicting what the NEWS will be, and such predicting can be as long range as desired, it must be remembered that newspapers seldom find fortunate and constructive events dramatic enough for publication. The favorable events indicated by progressions in the New Moon chart really take place, as often can be determined by enough personal effort. But only occasionally are they startling enough to make the newspaper headlines. Therefore, if the accuracy of the forecasts is to be determined, the predictions must be of the nature which commonly are featured in the newssheets. Our Los Angeles class thus makes several predictions for each day of the week in advance. These predictions are written down by the secretary, and usually by others. When the class again meets, these predictions are read, and clippings of prominent newspaper headlines, or copies of these prominent headlines, published for the day indicated, are read to indicate the degree in which the class has been able to state these headlines days before the events featured happened. In twenty-three years, with but one single exception, this class has picked the successful candidate in advance, not merely in national, but also in local elections. And this one error has taught us something quite important. I may say also that the class has picked the winner of every notable prizefight since 1915. Some of the students also have had much success predicting the outcome of ball games and horse races; but we do not permit charts relating to these, or to other things that might encourage gambling, to be discussed in our classes. In the important elections the predictions have been published months in advance. The method followed has been to obtain the birth charts of the contending candidates and carefully weigh one chart against the other, special attention being given to the progressions in the chart of each at the time, and immediately following the election. Where, as sometimes happens, there is difficulty in deciding which chart with its progressions is most favorable toward acquiring the office, a horary chart is erected, and the question asked if John Doe (naming one of the candidates) will be elected. 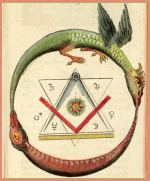 The chart is then judged according to the rules given in Chapter 6 (Serial Lesson 91), Course VIII, Horary Astrology, for determining the winner of a contest. In reference to elections, we have quite thoroughly demonstrated that Jupiter rules the Republican party, Saturn the Democratic party (at least as it existed before the New Deal), Neptune rules the Socialists, Uranus the Communists, and Pluto the New Deal policies inaugurated by President Franklin D. Roosevelt. If on election day there is a good aspect in the Jupiter Cycle, as happened November 6, 1928 (Jupiter sextile Mercury r) it indicates that the Republican party will poll a heavier vote than expected. If on election day there is a good aspect in the Saturn Cycle, as there was November 3, 1936 (Saturn conjunction Venus r and semisextile Mercury r) it indicates the Democratic party will poll a heavier vote than expected, many changing at the last minute to vote Democratic. But a discordant aspect in the Cycle Chart tends to influence things adversely on the last days, or during the time the aspect is operative, for the party ruled by the Cycle planet. The New Moon preceding an election also has considerable significance; although its trend should be considered in connection with the charts of the candidates. If the Tenth house and its ruler are powerful and harmonious, it indicates the party already in office is well entrenched. If the Fourth house and its ruler are powerful and harmonious, it indicates that the opposition to the party in office has much power. If the Tenth house is more powerful and harmonious than the Fourth, the party in power will tend to remain in power. But if the Fourth house is stronger and more harmonious than the Tenth, it indicates that the party which is in opposition to the one in power has the advantage, and tends to gain the election. The comparison of the strength of the birth charts, with the progressions then operative in both, as our Los Angeles class learned in the election of a governor for California in 1936, is not an infallible guide when taken apart from general political trends. Upton Sinclair (Chart is given in Chapter 8 (Serial Lesson 110), Course X-I, Delineating the Horoscope) has a stronger birth chart, and at the time his progressions were more powerfully favorable, than those of the opposing candidate for Governor. And his name (according to literary critics) will live long after most on earth today are forgotten. But Upton Sinclair had formulated an EPIC plan which was decidedly Socialistic in nature, and which he proposed should be placed in operation if he became governor of California. It was so radical a departure from the past that it became a national issue, with tremendous forces in opposition to it. These forces, which represented all factions desirous of preserving the economic structure of the past, were not interested in electing his opponent governor of California; but they were determined at all cost to see that Upton Sinclair did not become governor and start radical, far reaching economic changes. Upton Sinclair was not elected governor. Probably no one could have been elected governor who proposed such radical changes. He did, however, increase his following in an amazing manner, forced liberal changes in the national political platform, and gained tremendously in publicity and in prestige. Even though not enabling him to be governor, his progressed aspects brought him what he considered great advantages. He could not become governor, in spite of having a stronger birth chart and better progressed aspects than his adversary; because he had adopted a platform which was too far out of step with the trend of the times. In Raphael’s Ephemeris, and in some others, the exact time when the Moon makes the conjunction with the Sun each month is given in the aspectarian at the back of the ephemeris for that year. This conjunction of Moon with Sun is the New Moon. The time given in the ephemeris is Greenwich Mean Time. Therefore, if the chart for the New Moon is to be erected for some other locality, four minutes must be subtracted from this time for each degree West, or four minutes must be added to this time for each degree East, that this locality is from Greenwich. The time so obtained is the Local Mean Time of the New Moon at that place. And for this Local Mean Time at the place, the New Moon chart should be erected, just as if it were a birth chart. To find the Local Mean Time of the New Moon at Tokyo, for instance, which is 139 degrees, 46 minutes East; 9 hours, 19 minutes must be added. To find the Local Mean Time of the New Moon at Madrid, which is 3 degrees, 45 minutes West; 15 minutes must be subtracted. To find the Local Mean Time of the New Moon at Washington, which is 77 degrees West; 5 hours, 8 minutes must be subtracted from the time of the New Moon as given from Greenwich. To be able to determine, within 24 hours of the time they will happen, important events during the month solely from the New Moon Cycle, it is necessary to select the most prominent planets in the chart, and the dates on which the heaviest progressed aspects of the Moon are made to them. Starting with the New Moon of June 10, 1926, and taking the New Moon charts in chronological succession, I will give as many illustrations as space will permit, in each case quoting, with my own observations in parentheses, the event which actually happened from the WORLD ALMANAC. When the event falls on a day other than that on which the aspect is perfect, this will be duly noted. 131. New Moon illustrated to the left, took place June 10, 1926, 5:01 a.m. L.M.T 77W. 38N56. Mars is especially prominent through being in an angle conjunction Uranus and square Mercury, these two planets also being in angles. Each aspect the Moon makes to the position occupied by Mars in this chart during the subsequent lunar month, therefore, will coincide with events which partake of the strifeful nature of Mars, and events which relate to the houses Mars rules. Every such event, however, will not relate to the houses ruled by Mars, as some will merely be acts of violence such as Mars energy stimulates. Here we will consider only the progressed squares, opposition and conjunction of the Moon to the position of Mars. June 18, 1926, Moon opposition Mars r: Admission that the Pepper-Fisher campaign organization in Western Pennsylvania paid for the insertion of an advertisement (Mars in tenth indicates criticism of Administration and conflict in which it is involved) in which there was a forged letter bearing the signature of William Green, President of the American Federation of Labor (Mars trine Saturn in house of labor), was made to the Senate (Mars is co-ruler of house of Senate) Campaign Fund Investigating Committee at Washington. June 25, 1926, Moon square Mars r: June 24, at Mineola, N. Y., the four volunteer firemen of Rockville Center who admitted setting fire (Mars with Uranus in the tenth tends to public exposé) for a thrill got prison and reformatory sentences. July 1, 1926, Moon conjunction Mars r: Mrs. Alice M. Miller, art dealer, (because of business reverses, Mars in tenth) jumped to death from a hospital window at Baltimore. July 8, 1926, Moon square Mars r: The U. S. Circuit Court of Appeals (Moon trine Jupiter r in ninth) ruled at New York City that foreign “booze” ships (Moon trine Jupiter r in ninth) and cargoes may be searched and seized within 12-mile limit, but American liquor carriers can be seized anywhere inside or outside that limit. 132. New Moon illustrated left and above, took place July 9, 1926, 5:59 p.m. L.M.T. 77W. 38N56. With the New Moon conjunction Pluto in the house of foreign countries (seventh), affairs abroad would attain prominence; but as these planets are closely square to Mars in the house of newspapers and transportation, the progressed conjunction, opposition, squares and trines of the Moon could be depended upon to attract events of a strifeful nature, and events relative to the houses Mars rules. Not all the Mars events, however, would relate to the houses ruled by Mars. July 12, 1926, Moon trine Mars r from house of debts (eighth): An Anglo-French war debt agreement (Moon also conjunction Neptune r and Mercury r in house of debts) was signed at London (debts have continued to stir up strife). Sale of the Kansas City Star (Mars in third house) and its morning edition, the Kansas City Times, to the present management for years associated with Col. W. R. Nelson, founder, was announced by the trustees of the newspaper estate. July 17, 1926, Moon opposition Mars r from house of preachers (ninth): Claiming self-defense, the Rev. J. F. Norris, pastor of the First Baptist Church Ft. Worth, Texas, shot and killed D. E. Chipps, lumberman. July 22, 1926, Moon trine Mars r in house of transportation: The strike of the I. R. T. Subway men was ended by union leaders. July 23, 1926, Moon square Mars r: Lightning exploded forgotten dynamite in stone quarry (Mars ruler of fourth) at Strasburg Junction, Va., killing 5. The heat (Mars rules house of weather) killed 9 in and near N. Y. City. July 30, 1926, Moon conjunction Mars r: The Baroness Royce-Garnett leaped to death from a hotel (Mars rules house of hotels) at Miami, Florida. 133. New Moon illustrated above, took place August 8, 1926, 8:41 a.m. L.M.T. 77W. 38N56. Uranus in the seventh square Venus in tenth indicates important foreign developments, and also sudden and unusual events. Saturn in the house of money (second) square Neptune with the New Moon, indicate schemes relating to money which are unfavorable to the banks and the people. And as Jupiter is part of a T-square with Neptune and Saturn, and in the house of entertainment, loss or difficulty to entertainers is shown. Also, as Saturn rules the house of buildings, and is the planet of storms, loss may be expected through weather conditions. We will consider only the progressed conjunctions and oppositions to Uranus, Saturn, Jupiter and Neptune. August 8, 1926, Moon conjunction Neptune r (planet of intrigue) and opposition Jupiter r (finances): Ex-Premier Clemenceau of France, in an open letter, appeals to President Coolidge to consider France’s empty treasury and her sacrifices in blood and treasure (Moon is also square Saturn in house of money). August 12, 1926, Moon opposition Uranus r: N. Y. City traffic was held up by a thunder storm, with 3.24 inches of rain, windows were smashed and cornices tumbled; lightning started 15 fires. August 16, 1926, Moon conjunction Saturn r, ruler of destructive weather: Cyclones hit Ridgefield, N. J. and Glen Cove, N. Y., raising a dozen houses (Saturn co-ruler of fourth) at latter. August 23, 1926. Moon conjunction Jupiter r in house of actors: Rudolph Valentino, 31, moving picture actor, died (Moon also square Saturn and opposition Neptune, ruler of movies) at N. Y. City after an operation for gastric ulcer and appendicitis. August 25, 1926, Moon conjunction Uranus r: Miss Peggy Scott, 27, actress, killed herself at London (Uranus in house of other countries) because of Rudolph Valentino’s death. August 24, at Pittsburgh, enraged at refusal to discount his note for $2,000 (Moon trine Saturn in house of money), a man exploded a bomb (Moon trine Pluto the drastic planet) in the Farmer’s Deposit Savings Bank. The blast decapitated him, fatally injured 20 persons (Pluto rules groups) seriously and partly wrecked the bank. One hundred persons (Moon trine Pluto) were injured in a crowd of 30,000 that tried to get into the funeral church at N. Y. City to view the body of Rudolph Valentino. August 29, 1926, Moon opposition Saturn r, co-ruler of the land (fourth): An earthquake, the third in 1926, jarred New England from Western Maine to Canada. September 5, 1926, Moon conjunction Neptune r (planet of vacations) and opposition Jupiter r in house of pleasures (fifth): 30 were killed when the Scenic Limited (pleasure train) on the Denver and Rio Grande Western Ry. fell into the Arkansas River at Waco, Texas. The progressed aspects in the New Moon Cycle alone do not signify the importance of all the events for the month, for the most important events are attracted by progressed aspects in the cycles of the Major Planets. But when these more important events take place commonly is when the progressed Moon in its cycle adds energy of the same type, or to the same department of life, as that which in the heavier cycle is responsible for the event. That is, the progressed aspects in the New Moon chart not only attract Minor Events, but tend to TIME the Major Events during the month. To indicate just what is meant, I will take the last month for which at this time (1938) events are given in the WORLD ALMANAC, and quote, with my own comments in parentheses, ALL the events there given in so far as available space permits, and indicate the progressed aspect responsible for each event there listed. When the event falls on a day other than that on which the aspect is perfect, this will be duly noted. 366. New Moon illustrated at the endof this chapter/lesson, took place November 2, 1937, 11:08 p.m. L.M.T. 77W. 38N56. As Pluto moved into Leo for the first time this cycle on October 9, and abides there temporarily until November 21, this accentuation of the dominance of the Dictator influence abroad, and New Deal policies in the U. S., must be given due allowance. November 2, 1937, Moon opposition Uranus r in house of government: Fiorello H. La Guardia was reelected Mayor of New York City. As the Fusion, Republican, Progressive and American Labor candidate (rebelling against political bosses) he defeated Jeremiah T. Mahoney, the Democratic, Anti-Communist, Trades Union candidate by a plurality (quite unexpected) of more than 454,000 votes. Thomas E. Dewey (see chart with comments in Chapter 5 (Serial Lesson 10), Course IV, Ancient Masonry), Fusion, was elected District Attorney in Manhattan (he also had broken with the political machine)Joseph D. McGoldrick, was chosen City Controller, Detroit elected, as Mayor, R. W. Reading over a C. I. O. candidate. In Spain (Uranus ruler of foreign countries), the Rebels (Uranus) bombed the City of Lerida, killing 225, including school children. The Duke of Windsor (Uranus ruler of foreign countries) toured Paris slums to inspect a model (Uranus, reform) housing project for French workmen. In Brazil (foreign country), a passenger-freight train smash-up (Moon opposition Uranus) on the Central Railway, near Sao Paulo, killed 9 persons; 70 were injured. In Paraguay, the famous Corrales regiment revolted (Uranus) at Concepcion in an effort to restore the Chaco war hero, Col. Rafael Franco to the Presidency (Uranus in tenth). The government insists that the trouble is isolated in Concepcion and that reinforcements are being concentrated there from Asuncion and also from the Chaco. Martial law (Uranus in tenth changing status of authority) was put into effect in Asuncion. November 3, 1937, Sun opposition Uranus r in house of Government and ruler of house of other nations (seventh): The Conference called under the Nine-Power Treaty (Mars conjunction Jupiter in the sky October 29) to consider the Japan-China warfare, opened at Brussels. Ambassador Davis said means should be sought to end the conflict by peaceful methods. The British and the French seconded his words. The Italians warned (opposing our government) of any attempt to interfere in the conflict. A resolution condemning (Sun, or royalty, opposed by radical Uranus) the impending visit of the Duke and Duchess of Windsor to this country with the announced purpose of studying labor conditions was adopted unanimously by the Baltimore Federation of Labor, a unit of the A. F. of L. The stated objection to the proposed tour was based on labor hostility (progressed Moon sextile Jupiter and Mars in sixth) to Charles E. Bedaux, a labor efficiency expert, who sponsors the tour and is author of a production speedup (Mars in house of work) system. Brazil (Uranus ruling seventh) closed its coffee markets, the government saying that it intended to abandon (Uranian sudden change) its price control program for coffee and adopt a policy of open competition, also reducing the present export tax (progressed Moon sextile Neptune in foreign nation’s house of taxes, second) on coffee by about 75 per cent. Near Seattle, 5 navy flyers (progressed Moon sextile Neptune, planet of aviation) were killed and two others rode to safety in parachutes when a bomber and a pursuit plane collided during gunnery maneuvers high above Boeing Field. Pope Pius (progressed Moon sextile Jupiter) left the Vatican and went to the Church of St. John Lateran, where he inaugurated the pontificial Roman Atheneum, built out of his private purse at a cost (Jupiter) of about $500,000. November 4, 1937, Sun opposition Uranus r; Mars in orb of opposition of drastic Pluto r in Mars Cycle; Moon trine Pluto r and Saturn r in New Moon Cycle: Germany (foreign nation) has offered her services for mediation (Moon trine Saturn r in house of treaties) of the Sino-Japanese conflict. In Mexico (seventh house ruled by radical Uranus) President Lazaro Cardenas decreed the nationalization (Uranus) of 350,000 acres of oil lands under lease to the Standard Oil Co. of California, as part of the nationalization of 2,000,000 acres of oil territory in the three Southern States of Tabasco, Campeche and Chiapas. A surrogate (Moon trine Saturn r in ninth) in N. Y. City admitted to probate the will (Moon sextile Neptune r, ruler of eighth) of the late Col. E. H. R Green which left most of his estate to his sister, Mrs. Matthew A. Wilks. The latter had agreed to pay $500,000 in cash to Green’s widow, who had signed away her dower right to one-third of the estate and thereby was given $18,000 a year from a trust fund. In Berlin (Uranus ruler of seventh), Adolph Rembte 35, and Robert Stamm, 37, Communist Labor leaders, were executed (Mars opposition Pluto r in Mars Cycle) on charges of attempting to recreate (rebelling at authority) an illegal political organization. William Green, president of the A. F. of L., cabled Chancellor Hitler, protesting (Sun opposition Uranus) the sentences and asking a pardon for the men. November 5, 1937, Sun (royalty) opposition Uranus r still within orb; Moon inconjunct Uranus r, semisextile Sun r: The Duke of Windsor announced, in Paris, that he has decided to postpone his visit to America, and that he “arrived at this decision with great reluctance and after much deliberation, but he feels that owing to grave misconceptions which have arisen and misstatements which have appeared regarding the motives and purposes of his industrial tour there is no alternative but to defer it for the present” (sudden radical change of plans). November 6, 1937, Mars on November 5 opposition Pluto r in twelfth of Mars Cycle; Moon square Neptune r and square Saturn r in New Moon Cycle; The Nine-Power Treaty Conference sent a conciliatory (Saturn in house of treaties, ninth) message to Japan inviting her to exchange views regarding the Chinese conflict (Mars) with “a small number of Powers (Pluto rules groups) to be chosen for that purpose.” Norman H. Davis, U. S. delegate, was defeated in an effort to include a phrase declaring force (Mars) had never solved a dispute (Japan flaunted the Conference). The American Med. Assoc. reported the 70th death (Mars rules the house of death in the Mars Cycle) is attributed to use of an elixir of sulfanilamide containing (Neptune rules poisons) diethlene glycol. The latest case (Neptune rules house of death) is in Porterdale, Ga. In Cincinnati, a jury, (Saturn in house of jury) of 11 women and a man decreed that Mrs. Anna Marie Hahn, 31, should die in the electric chair for the poison murder of Jacob Wagner, 78, one of four men (Pluto rules groups) she is alleged to have killed (Mars opposition Pluto in house of crime in the Mars Cycle) for their money. The U. S. State Department has been told that many Haitians, maybe 1,000 or more, who crossed the border into the Dominican Republic seeking work (Mars in house of work opposition Pluto in Mars Cycle), mostly in October, were killed (mass executions) by Dominican soldiers in expelling them (Moon square Saturn r in their house of travel). Italy joined Germany and Japan (Pluto group of Dictators) in their pact (Moon square Saturn r in house of pacts) against communism, signing it in a ceremony at Rome. The Communist International, defying (Mars) the pact signatories, issued an appeal to the workers of the world to join forces against fascism in Spain and China. The event which gets the largest headline on the front page of the newssheets is the one indicated by the most powerful accumulation of planetary energy on that day. Usually the front page of a newspaper will carry from three to five fairly prominent headlines, relating to that many different events, the relative importance of each being indicated by the boldness of the type. Therefore, using the progressed Sun and Moon in the New Moon Cycle both to time more significant events and to indicate less important ones, it is usually safe, considering progressed aspects in all the Major Cycles as well as those in Cycles of Sun and Moon, to predict from three to five definite events for each day. However, close to the time of a Major Conjunction, or to the time when some heavy progressed aspect forms in a Major Cycle, a single event, or train of events indicated thus, may so interest the public that the newspapers permit it to push other matters from the front pages, and all but the most important of other events are given no notice even on the back pages. As an example of this run of the mill day by day predicting, such as we have done each week for the last 23 years in the Los Angeles class, I will use for example the last New Moon previous to the time this is being written, indicate the actual aspects we used in class work from which to make predictions, and quote the newspaper headline which coincided with each. In no case will such a headline be quoted unless dated within 24 hours of the perfection of the progressed aspect. Quoting thus from the LOS ANGELES EXAMINER, with my own comments in parentheses, I will continue as far as available space permits. 367. New Moon illustrated at the endof this chapter/lesson, took place March 2, 1938, 0:33 a.m. L.M.T. 77W. 38N56. In estimating the trend of this New Moon it must be taken into consideration that when a new planetary Cycle starts, the things ruled by that planet tend to come into prominence; and that a new SATURN CYCLE commences March 5, 1938, 9:04 a.m. L.M.T. 77W. 38N56. Saturn rules the weather in its destructiveness, and in this new Saturn Cycle drastic Pluto is in the house of the weather (fourth) square Mars and Moon and trine Saturn. Looking ahead in the heavy Cycle charts we find Neptune, the promotion planet, progressed to sextile Jupiter r, the financial and religious planet, in the house of the people of the Neptune Cycle (chart illustrated in Chapter 2, Serial Lesson 142). The aspect is complete on March 12, but is within orb of influence all month. In the Jupiter Cycle (chart illustrated in Chapter 5, Serial Lesson 145), this planet of finances and religion comes to the sextile of Saturn r, in the house of roads and railroads (third) and co-ruler of weather and buildings (fourth), March 3, and is within orb of influence during the first week of March. In the Mars Cycle (data in Chapter 6, Serial Lesson 146) Mars reaches the square of the drastic planet and the planet of dictators, Pluto r, March 10. In the Sun Cycle (chart illustrated in Chapter 8, Serial Lesson 148), the Sun progresses to sesquisquare Pluto r on March 2, to opposition Neptune r in house of Congress on March 8; and to trine Moon r in house of court on March 10. 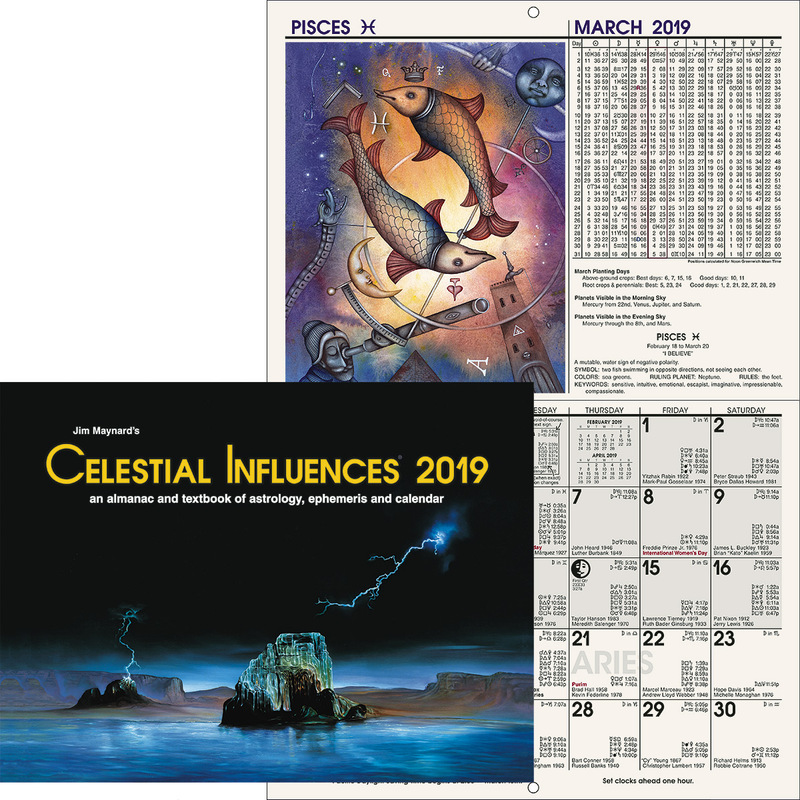 Bearing these heavy influences in mind, let us now look at the New Moon of March 2 (chart at the endof this chapter/serial lesson). There we find a concentration of four planets in the house of roads and railroads, with heavy afflictions, indicating disasters affecting such travel. Venus in the house of weather opposite Neptune, and Saturn also in that house, are not favorable to property; Pluto in house of death square Mars shows death of groups; Mars and Uranus in fifth, show prominence of vice, gambling, and misfortune to children. March 2, 1938, Moon opposition Neptune r in house of business and the Administration (tenth): Baruch attacks U. S. in business. Baruch hits Government farm (Moon conjunction Venus r in house of farms) program. Moon sextile Uranus r in house of actors and love (fifth): Stokowski, Garbo (both prominent in entertainment world) secret rites hinted. Moon conjunction Venus r in house of weather: Heavy storm, landslides maroon scores in canyon. March 3, 1938, Moon conjunction Saturn r in house of weather, and trine Pluto r in house of death (eighth): 28 die in storm; property (fourth) losses mount in millions. Return of kidnap (Pluto) victim predicted. Two leaders blame slump on New Deal (Pluto). Two killed (Pluto in eighth) when avalanche crushes house (Saturn in fourth). March 4, 1938, Sun sesquisquare Pluto r in house of death (eighth); Moon sextile Jupiter r in house of roads (third:) 55 known dead (Pluto in eighth), 60 missing, 1500 homeless after flood. Railroads, highways (Jupiter in third) blocked and wires down. Logan asks churches (Jupiter Cycle aspect accentuated by Moon aspecting Jupiter r) to back U. S. defense. March 5, 1938, Moon conjunction Mars r in house of entertainment, children and gambling (fifth), and square Pluto in house of death (eighth): 19 horses await call in big race. Kidnap (Pluto) boy (Mars in fifth) ransom ready. A father finds his dead (Pluto) child (fifth). 94 known dead. Chamberlain tries to calm Hitler (Pluto). Coast cities periled (in case of war, Mars) says Representative Maverick. March 6, 1938, Moon conjunction Uranus r in fifth: Railroads (Uranus ruling cusp of third) reopen services with train-bus system. Says everybody is hypnotized (Uranus); maintains men and women capable of surprising feats. Child (fifth house) killed, five injured when train hits auto. New ramifications may be bared (alleged political exposé) in Neblett suit. Russian (Uranus rules Russia) woman may doom 21 to escape death. Stagehand (race horse which won Santa Anita derby) expected to win Kentucky derby (fifth). March 7, 1938, Moon trine Neptune r, sextile Venus r. square Jupiter r, sextile Pluto r: Rebel war ship wrecked by Spanish flyers (Neptune). U. S. sacrifice of Philippine (Venus in house of territory) defense line urged as protection for West Coast. L. A. notables to attend lecture by First Lady (Venus and aspect to ruler of tenth). $2,070,000 (Jupiter) request authorized by vote of City Council (of Government, Neptune in tenth). More bodies of victims (Pluto in eighth) found in L.A. County work. March 8, 1938, Sun semisextile Jupiter r, conjunction Venus r, in fourth; Moon square Mercury r, square Sun-Moon r: U. S., State and City speed cleanup of damage in storm (fourth). House (Sun opposition Neptune r in Sun Cycle) limits publicity on pay (Jupiter) checks. Landowners (Venus in fourth) aided by court (Sun rules ninth) ruling. U. S. to colonize (Venus in fourth) two islands. 10 per cent raise (Jupiter) granted rails (third house). March 9, 1938, Moon square Neptune r, square Venus r, trine Jupiter r, sextile Mars r: Proposed appropriation (Jupiter) by Legislature (Sun opposition Neptune r in house of Legislature in Sun Cycle) would save L. A. County $3,000,000. Wheeler sees dictatorship in reorganization (Neptune in tenth) bill. Mystery (Neptune) surrounds Anglo-Italian peace discussions. Flyers (Neptune) rain bombs (Mars) in Chinese city. Terrifying power in arms (Mars) voted by British House. Youth (Mars in fifth) near death as mimicry of movie fails. March 10, 1938, Mars square Pluto r in Mars Cycle; Sun trine Moon r in Sun Cycle; Moon sextile Uranus r, square Saturn r, trine Mercury r, Sun-Moon r: Hitler (Pluto) moves on Austria (Mercury ruler of foreign lands). Japan seeks to force (Mars-Pluto) China (to gain territory, Saturn) into peace pact. Convicted dynamiter (Mars square Pluto in house of crime) raps State Supreme Court (Moon in ninth of Sun Cycle). Spencer Tracy and Luise Rainer win motion picture (Uranus in fifth) academy awards. Neblett denies McAdoo aided post office deal (Mercury in third). Whitney, stock exchange (Uranus in fifth) ex-president, arrested on $800,000 larceny charges. German (Pluto) envoy’s arrival for London parleys draws threatening (Mars square Pluto) crowds. March 11, 1938, Sun opposition Neptune r; Moon sextile Neptune r, trine Venus r, square Mars r: Card game (Mars in fifth) killing scene told to jury by neighbor. Hitler troops (Mars) seize Austria (Neptune in house of territory of other countries, tenth). Neblett, Hahn row over quiz on libel (has national repercussions). Blum (Popular Front premier, Neptune) fights odds to form cabinet. Roosevelt urges flood control (Venus in fourth) plan. March 12, Neptune sextile Jupiter r in Neptune Cycle (a million Jews must leave Austria now because of race and religion); Moon conjunction Pluto r (Mars still within orb of square Pluto r in Mars Cycle early in the day), trine Saturn r: Hitler (Pluto) crushes Vienna government, takes personal control, purge (of opposition) under way. New Deal (Pluto) clauses rejected as House passes tax (Pluto in house of taxes) bill. Uncertainty grips Jews in Vienna. 18 (Pluto in house of death) condemned in Soviet treason trial. Home (Saturn in fourth) financing in steady upturn over U. S. Says Hitler (Pluto) in speech, “Today All Germany is ours, tomorrow the whole world” (Saturn). 11:08 P.M. L.M.T. Washington, D.C.
Opposition of Sun-Moon-Mercury to Uranus in house of Government (tenth) brought abrupt changes in Administration policies and in governing positions. It marked recognition of a Major Business Recession, with consequent increasing unemployment (Mars conjunction Jupiter in sixth), and effort to release money (Neptune in second trine Uranus and Mars-Jupiter) with which to stimulate business (Uranus in tenth) and employment (Mars-Jupiter in sixth). Events in foreign lands (Uranus ruling seventh) took a sudden turn which caused both people (Sun ruler of first) and Government (Uranus in tenth) much anxiety, and affected business adversely (opposition). 0:33 A.M. L.M.T., Washington, D.C. Schemes (Neptune) for reorganizing government (tenth) were a source of conflict (Venus opposition Neptune). Ex-President of stock exchange (Uranus and Mars in fifth) plead guilty of grand larceny; stocks tumbled. Floods and tornadoes (Venus and Saturn in fourth) damaged much property, and made roads and railroads (afflicted planets in third) impassable. Vice exposé (Uranus in fifth) and gang (Pluto square Mars in fifth) bombing as result of vice investigation gained much attention. Railroads were given a 10 percent raise (Jupiter in third). A move to halt aviation (Neptune) bombing of civilians in war was launched.